Eurologs made a conscious decision for quality, durable and sensible timber. So, the choice is easy: Cedar (Inland Western Red Cedar). After all, cedar is the best type of timber available, as the cedar oil contained in it provides natural protection against rot, mould and insects. In Canada and the United States, for instance, cedar is often used for the construction of homes. It is the only type of timber that may be transported from one country to another, or any other part of the world, without being treated, i.e. impregnated. Cedar timber is durable, light, very stable and easy to process, as it has a straight thread and a fine grain structure. 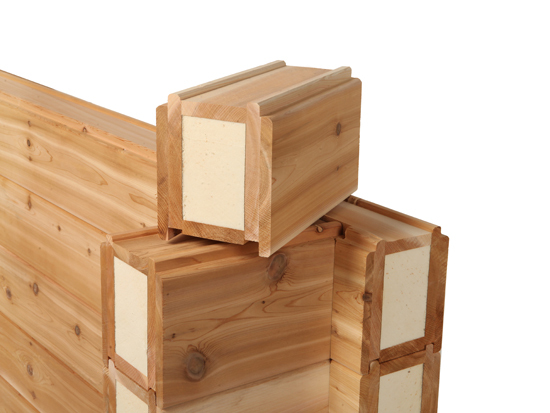 By laminating cedar, this constructive log will become 70% stronger than an ordinary plank of timber or a full log. Various timber parts are glued together, the so-called laminated log system, as a result of which they can reach longer lengths than planks from one piece. Then, the laminated logs are warp-proof, show hardly or no tears and will have a permanent exact fit. A greater flexibility of laminated, oven dried timber, because it is much easier to process. Timber in general, also has a hygroscopic action. This means that, by nature, it is able to absorb an excess amount of moisture in a home, or (in case of very dry air) to release moisture again if there is too little. This characteristic is good for people’s health. Because too much moist in the air results in complaints such as muscular pain or rheumatism. Regular or continuous exposure to dry air, on the contrary, leads to complaints such as dry mucous membranes, resulting in irritating tickling coughs, colds, sore throats or dry and irritated eyes. Tests show that timber as such, leads to less secretion of the carcinogenic gas Radon, which usually is released with common building materials such as gravel and sand, which are used in concrete. Vague physical complaints are very often caused by these gases, and can therefore be avoided by deciding to go for a timber home. Through good ventilation of a traditional home, it is possible to reduce the concentration of radon in the inside air, and thus the exposure of occupants to the gas. However, prevention is better than cure. For that reason, it is better to use construction materials that have no or very little radon emission. So, timber frame constructions hold the trumps in this respect. Because both the walls and the intermediate floor are made of a timber construction, there can be no emission of radon. If the walls are also finished with timber or even plasterboard, you will have radon free or low-radon materials. Additional information in Dutch can be found on the following website: www.gezondbinnen.nl. Eurologs takes the living space and the environment into account. Our timber homes and applications are characterized by an excellent heat economy. Little heat gets wasted in heated rooms, because of the high insulative characteristic of timber. If, however, you are looking for a cooler room, this can be realized in very little time. Because of our construction system, any insulation value can be attained. In this way, we can directly respond to your requirements in this field and at the same time comply with national laws and regulations. If you like to look at large logs and would therefore prefer not to insulate your house extra, you will have to use a minimum solid log of 25 cm thick. If the solid wall is less than 25 cm thick, it will not comply with the Dutch building regulations, and you will still have to insulate it. The timber frame construction is known as a building system that scores very well in the field of energy efficiency. The latest requirement in the field of energy performance (EPC 0,8) are easy to realize as well. The construction method is also suitable for the application of various energy efficient heating systems (radiators, wall, floor, air, and low temperature heating, etc.). As a result of the limited mass, relatively little energy is required to heat up the house in cold periods. And that will certainly save money.